BIG FAT CAKE » BLOG » What’s Your Invitation Style? Since your wedding invitation is the very first thing that your guests will see, it should set the tone for your wedding. As the expression goes, “nothing beats a good first impression,” the same goes for your invitations. Get your guests excited about your wedding with some beautiful invitations that reflect you and your wedding day. Real Simple Weddings magazine has a section devoted to wedding invitation styles, wording, and etiquette (it also has a lot of checklists and other helpful tips for planning your wedding and I totally recommend shelling out the $13 for a copy – the 2008 and 2009 editions are pretty similar so see if a recently married friend has a copy you can have!). 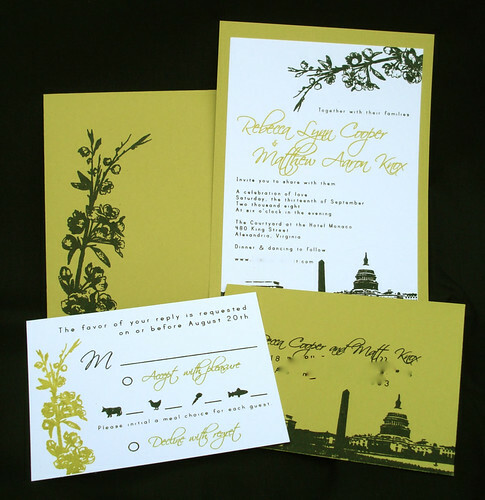 Thematic: These beautiful invitations are screen printed using a Gocco. Unfortunately Gocco's are hard to find these days but you could recreate a similar look using photoshop and your printer. Thematic invitations typically reflect a location or an activity (e.g., country & western, music, theater etc). 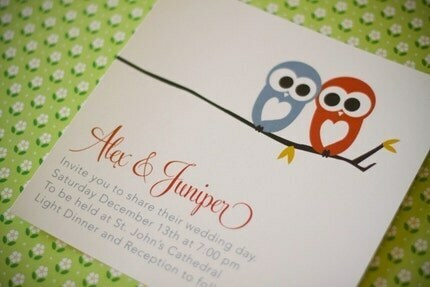 Semi-Formal: These invitations are typically classic and simple, but with a unique graphic or element. Whimsical: I'm such a fan of whimsical - it's probably my favorite category because you can be so creative with it! Designs in this category usually include quirky fonts, unique materials (e.g., printing on wood veneer), and unexpected embelishments. I hope these samples inspire you with your invitation design! What type of invitation will you be going with for your wedding, and how will it reflect the style of your wedding day? This entry was posted in Design Ideas, General Planning, Wedding Themes and tagged Design Ideas, ideas, invitation, style, wedding. Bookmark the permalink.